My Charlie had his first day of preschool last week. How cute is this little man with his big book bag? 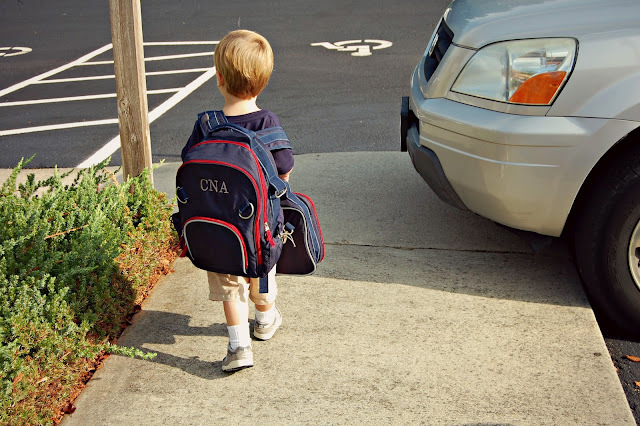 When we walked up to Charlie's classroom last week, he put his bag by his spot, went straight into the classroom, turned around, and said "Bye, Mom!" Mom? Break my heart a million times. But, I'm so glad he loves school and his amazing teachers! Go here to see if you won the Halloween tutu! 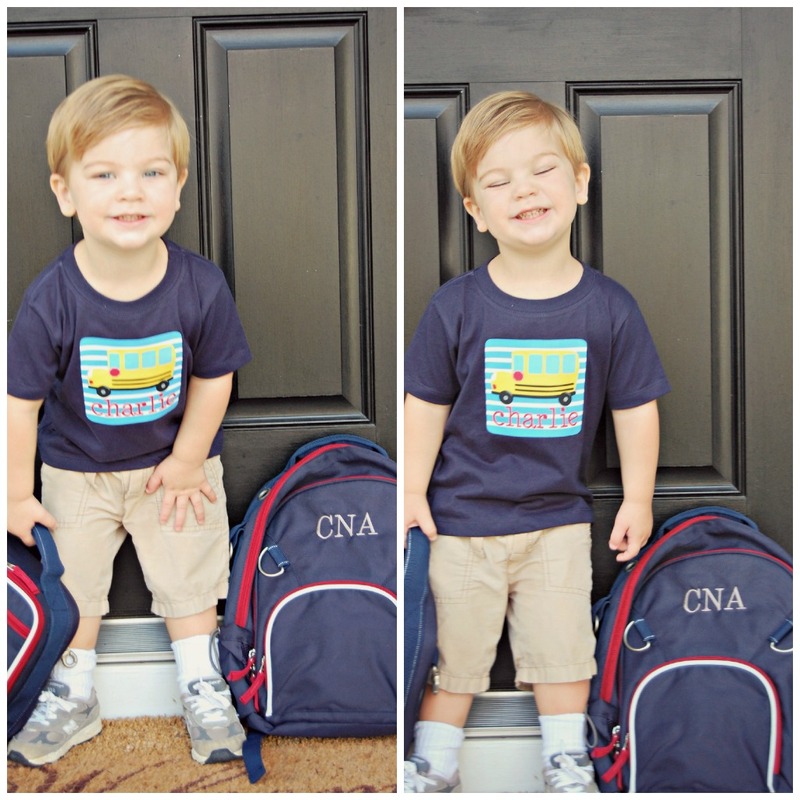 Ok...his little shirt, bookbag, and lunchbox....too cute! i can't handle how cute he is!! seriously. that backpack. the whole deal. SO precious! he is adorable!! those pictures are great! Charlie is looking more and more handsome! You're gonna have to fend off those little preschool girls with a stick! Cute kid! I think it's good for them to go to school and have that for themselves. It's also good for us! Harper cried her first few days of preschool, but she did great last Thursday. She will go back tomorrow, I am hoping she doesn't cry. It's much better when they are happy and excited! what a lovely blog you have girl! i just stumbled upon it :) your little ones are so sweet! now following you via GFC and lookin' forward to reading more! your "favorite things" link up sounds so fun! On Bree's first day, when I left and told her bye...she looked at me like I was annoying the crap out of her. So funny! Way to go Charlie! What a big boy! Wait until kindergarten starts...why does time fly so fast??? Charlie is super cute! Hope he had the time of his life! OHMYGOSH!! I love his little shirt, and his backpack that is almost as big as he is!! Take it all in...it goes by way, way to fast. Aww your boys are adorable! Glad Charlie's liking school! Awe! 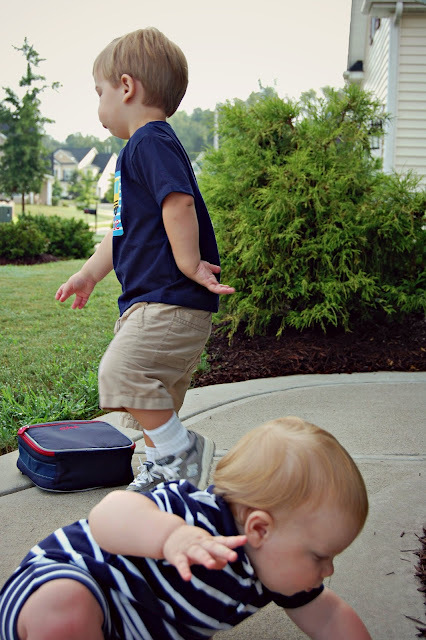 And yes a bitter sweet thing when they are that excited and that ready to say goodbye to mommy. Such a cutie and independent little man! So cute!! Love him with his backpack! what a little cutie! and wow, i just stopped by your about me page... i was born and raised in Chapel Hill (moved away when I was starting 5th grade)! I was even named after the Carolina Tarheels hahaha... I loved elementary school in NC, I hope this little guy gets the same great experiences I did! aw i am sure that was hard for you, but i am so glad he likes school!! 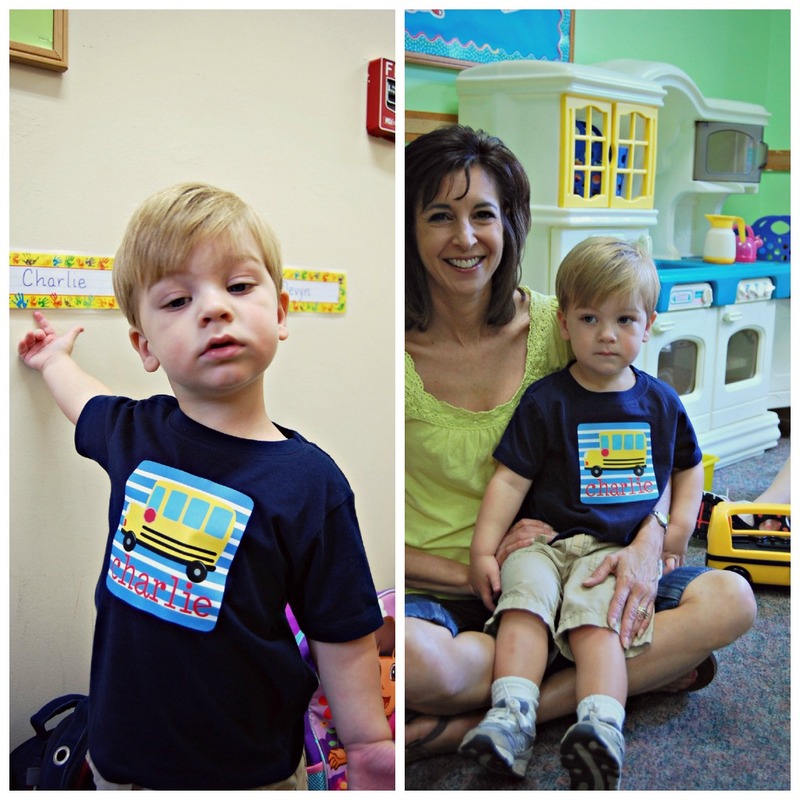 :) he looked absolutely adorable on his first day!